Local elections were held in Croatia on May 21st. This was the first time since the 1990 that the radical left has made significant gains, which is especially encouraging in light of the probable parliamentary snap elections in September. If we’re the 99%, why are we still at .. 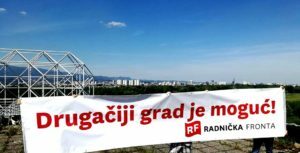 In the capital of Zagreb, the wide left front (consisting of five, mostly new or newish, parties – ranging from left liberals to anti-capitalists) got 7,64% in the elections for the city council (around 24.000 votes). 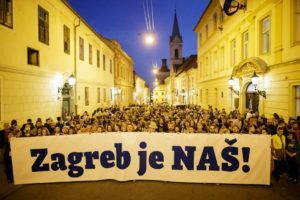 In lower levels of local government, the left front “Zagreb je nas” had even better results – close to 30% in some cases. The explicitly anti-capitalist Workers’ Front party got one city council member in Zagreb – which is the first such case since the introduction of multiparty elections in 1990. The Workers’ Front also gained 3 representatives in city district councils and 12 representatives in local councils in Zagreb, which is also a huge advance for an upstart radical left party. Outside of Zagreb, the anti-capitalist WF did not pass the electoral threshold of 5% but has made significant gains nonetheless, which may be crucial in the upcoming parliamentary election. In the coast town of Pula, the 8th largest city in Croatia the Workers’ Front mayor candidate got 4,21% (the list for the city council got 3,83%, the list for the whole region of Istria, including the rural areas, 1,99%). In Samobor, a smaller town close to the capital of Zagreb, the Workers’ Front mayor candidate got 3,12% (the list for the city council 2,39%). In the second largest town in Croatia, Split, the coalition of the Workers’ front with a left liberal/social democratic party got 4,36%, staying just a couple of hundred votes from the 5% threshold for the city council. These results may not seem spectacular, but they’re the highest results the radical left has won electorally in the 27 years of post-socialist Croatia and they indicate a strong tendency in the rise of the left vote – and a good sign for the upcoming parliamentary elections.